It’s July 15 and the Washington Nationals are 3 games ahead of the Atlanta Braves for the National League East lead. The Nats are playing fantastic baseball at 51-35 and one of the many reasons for that is one of their ace pitchers, the young, talented, and highly touted Stephen Strasburg. Not to take anything away from Gio Gonzalez who is having a fantastic year on the mound for the Nationals (12-4, 2.39 ERA, 127 strikeouts in 107 2/3 innings) and who at age 26 has a bright future ahead of himself also, but the most important player to Washington’s future is Mr. Strasburg. Strasburg is so important to the franchise, that General Manager and Executive Vice President of Baseball Operations, Mike Rizzo, has imposed innings limit (presumably 160, as Jordan Zimmermann had last season recovering from Tommy John surgery) on their young star prior to this season and as of today he and the other team executives are sticking to their guns on that limit. 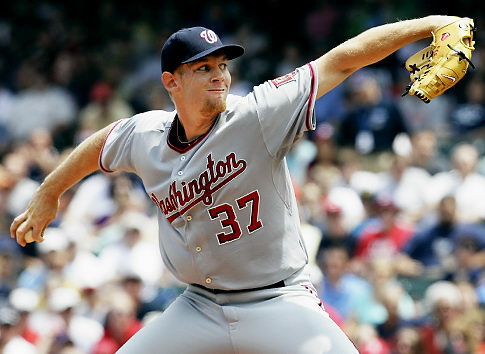 See, late in the 2011 season, Stephen Strasburg had the same surgery as Zimmermann and many other professional athletes, the hugely popular Tommy John surgery (medically known as ulnar collateral ligament reconstruction) in which a ligament in the elbow is replaced with a tendon from somewhere else in the body. Full rehabilitation from this procedure usually takes almost a year for pitchers and about six months for position players, but Strasburg has come back healthy and effective on the mound. This season Strasburg is 10-4 with a 2.66 ERA, but more importantly he’s thrown a total of 105 regular season innings (including his 6 shutout innings today). The Nats ace has struck out 135 batters in those innings, so as you can see he is an exciting player to watch and a guy that the Nationals need healthy if they want to compete for years to come. That’s where things get a bit sticky. At some point the Nationals need to take a look at what’s best for their franchise; whether that be to winning now or hoping to have Strasburg for the very long-term future. Obviously the team won’t do anything to put the team or Strasburg’s health in jeopardy, but they do have decisions to make should they remain in the hunt for the pennant. Assuming the 160 innings limit on Zimmermann last year, and the fact that Strasburg has averaged just about 6 innings per start this year, it’s not out of the realm of possibility to think that he has only 9 starts remaining in his 2012 season. Since there hasn’t been any official word on what exactly his innings limit is, we also don’t know if a potential playoff appearance for the Nats will extend that limit, so anything I mention in these next few paragraphs is pure speculation from a concerned baseball fan. Now, I don’t know exactly what the Nationals should do. I have my theories, but from my distant perspective I feel that we should trust the Washington medical staff and their baseball operations personnel no matter what decision they ultimately make. In reality, those decisions most directly impact that franchise anyway, so us outsiders shouldn’t care all that much. Part of the fun in watching sports is speculation and wonder, and also second guessing teams, their decisions, and executions of those decisions after the fact. In my humble opinion, I’d sit Strasburg down after his next start. 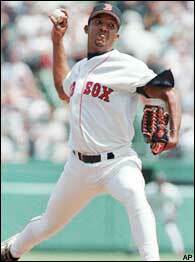 Pedro Martinez, the ace of the Red Sox organization from 1998-2004 used to take a couple week break during the middle of each season in Boston. The Red Sox knew that Pedro, who was officially listed at 5’11”, 195 pounds (but was really smaller than that), was injury prone so they let him, his mind, and his body take a short break each year to have him ready for the stretch run. It usually paid off for the team, especially in 2004 when the team finally broke through with a World Series championship. I could see something very similar happening with Strasburg, especially if the Nationals are able to stay in the driver’s seat without him (which I have a feeling they can with Gonzalez, Zimmermann, Edwin Jackson, and Ross Detwiler holding down the fort for the few weeks he sits). Would it be easy for the Nationals to survive without him? Of course not, but it takes a lot to win a championship. If the team can play well without him then they will be even more ready to compete with him. If Strasburg misses two or three starts now then he will be even more amped to pitch meaningful games down the stretch and into the playoffs. He’ll also get more experience in learning hitter’s tendencies and to chance to watch more film. He won’t be shutdown completely, so there’s also a chance he could get even stronger by resting as he can focus more on off-field workouts for a couple weeks. If the Nationals are going to stick to their self-imposed innings limit, they will need to rest Strasburg at some point. In my opinion that time is coming soon so that he won’t miss any September (or October) baseball. When asked what would happen if the Nationals made the World Series on MLB Network Radio, Strasburg answered, “They’re going to have to rip the ball out of my hands”. Well, Mr. Rizzo and manager Davey Johnson, is that something you want to do? The answer to that question is “NO”, probably even “Heck NO”. ESPN’s Buster Olney has said that “if they (the Nationals) actually do (shut him down, if he hits his limit around the first week of September), I’ll actually have more respect for them, because that’s going to take some serious guts”. It shouldn’t even get that far. The team needs to sit Strasburg before then, or not at all. This could be their year and I would hate to see it end with their gun still in the holster. This entry was posted in MLB and tagged Baseball, MLB, Nationals, Sports, Stephen Strasburg, Tommy John, Washington. Bookmark the permalink.